Brighton Ford : Ford Volunteer Corps' "Ford Accelerated Action Day"
Ford Volunteer Corps' "Ford Accelerated Action Day"
BRIGHTON, Mich - Some helping hands around Ford Motor Company have enlisted hundreds of Ford employees to volunteer at 32 different nonprofit locations across southeast Michigan today. Ford Volunteer Corps' "Ford Accelerated Action Day" will devote an entire day to working for children and families to brighten up the community. Over 500 Ford employees will be painting shelters, renovating family centers and helping to build homes around southeast Michigan. The organizations Ford will be working with will share more than $57,000 in Ford grants to purchase tools, supplies and other materials that are needed to complete the projects. Ford Motor Company is using their people and recourses to their advantage to help create a better foundation for people in the community. 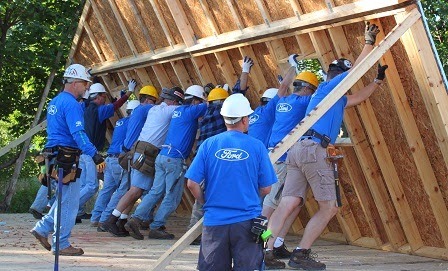 Thousands of Ford employees from all over the world participate in community service activities year round. They are not just painting and building these projects, they are also serving as mentors to young people and engaging them in educational activities. Ford Volunteer Corps' "Ford Accelerated Action Day" focuses mainly high-priority projects and other community service involvement throughout the year takes in place within Ford employees home towns. Thank you for all that you are doing today, Ford Volunteers! Brighton Ford is proud to be involved in our local and surrounding communities. To see what we have going on right now, visit our Community Events Page! We are located at 8240 Grand River Ave. just north of I-96 in Brighton. We are a family owned and operated business that strives for customer satisfaction. For more information on Brighton Ford visit BrightonFord.com or give us a call at (800) 836-8206.